Information and Communication Technology (ICT) is an industry which is growing at an incredible pace; and the recent research conducted by ITU or International Telecom Union and released by UN states some interesting data related with its usage and spread. Buoyed by cheaper mobile phones and even cheaper mobile tariffs, more and more people are joining the Information Highway, and using the Web for their everyday activities. Digest this: By the end of 2013, there would be 6.8 billion mobile users all over the world, which is almost equal to the world’s population! – Globally, there are 2.7 billion people who are online. This means that around 38% of the world’s population today can access internet and use the web for finding and sharing information. – 4.4 billion People or roughly 1 billion households are still without internet connectivity or out of reach from accessing this network. – In this year, around 250 million people used Internet for the first time. – Mobile internet or Mobile broadband is now cheaper than traditional fixed broadband. 2 Mbps is now the standard package for using mobile internet, globally. – 3G users constitute 30% of all mobile broadband users, globally; which means that around 2.1 billion people are able to access 3G networks for connecting internet with their mobiles. This is increasing at a rate of 30% annually. – By the end of 2012, almost 50% of world’s population was be covered by a 3G network. – Between 2007 and 2001, revenues from Telecommunication Industry all over the world grew to $ 1.8 Trillion or roughly about 2.6% of World’s GDP. In developing countries, revenues from telecommunication industry grew between 26 to 30%, which highlights the importance and relevance of this industry in the overall growth of the countries. – Mobile Internet plans, on an average have come down more than 80% all over the world. 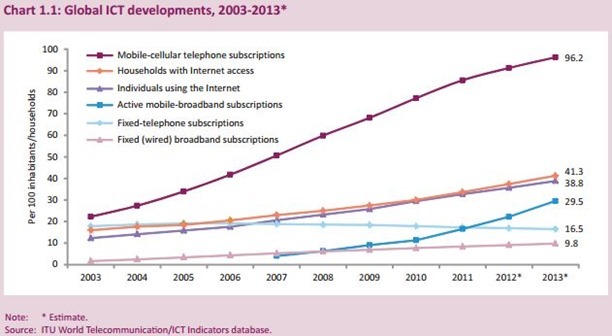 And this trend has been observed after taking note of mobile broadband tariffs across 160 countries. While in 2008, average mobile Internet plans were 115% of average monthly income per capita, in 2012, it fell down to 22%, enabling people from lower income strata to access mobile and Internet. 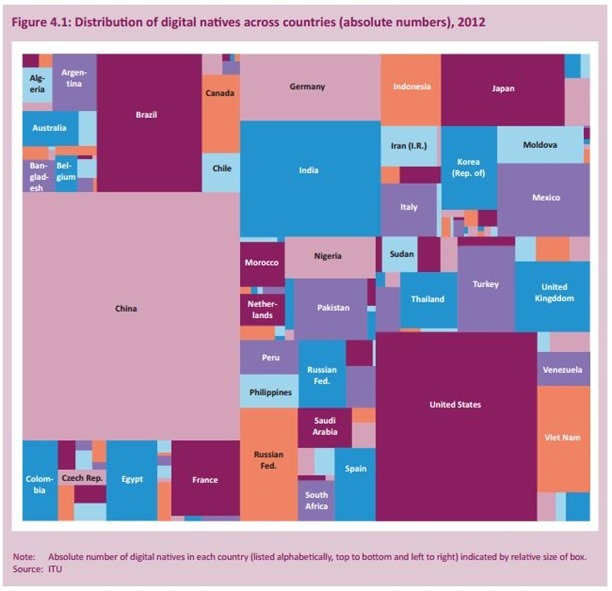 – ITU’s annual ranking of Internet access across the globe puts South Korea at #1, third year in row. Sweden, Iceland, Denmark, Finland and Norway are trailing behind South Korea in penetration of Internet users based on area. USA is ranked at a distant 11th position. – Digital naive or those users who are aged between 15-24 constitutes the largest user base of Internet – on mobile and off mobile. This data strongly suggests that the new Internet user is mobile, on the move and is not afraid to try out new technologies. For a Digital Entrepreneur, this is excellent news. More people are coming online and using the web to find information, perform tasks and share data. The dotcom bubble is now left behind, and a new sense of optimism is gripping the Online world. What are your views on this expansion of Internet and Mobile users all over the globe? Can it sustain its growth and usher a new wave of progress and development? Please share your views in the comments section.